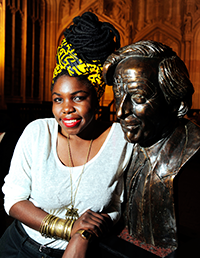 Congratulations are in order for Kenyan writer, Okwiri Oduor who emerged as the 2014 winner for the prestigious Caine Prize for African Writing. Oduor scooped the award for her short story entitled ‘My Father's Head’ form Feast, Famine and Potluck. This year marks fifteen years of the annual Caine Prize rewarded to African writers for short stories published in English with a reward of £10,000. Other shortlisted candidates were: Diane Awerbuck (South Africa) "Phosphorescence" in Cabin Fever, Efemia Chela (Ghana/Zambia) "Chicken" in Feast, Famine and Potluck, Tendai Huchu (Zimbabwe) "The Intervention" in Open Road Review, issue 7 and Billy Kahora (Kenya) "The Gorilla's Apprentice" in Granta. Last year's Caine Prize was won by Nigerian writer, Tope Folarin.